Onyx, the well known American hip hop group composed of Sticky Fingaz and Fredro Starr made an impact on the music scene in the early '90s. Their music also appeared in movies such as How High and 8 Mile. You might have even heard their music in Gatorade commercials. These folks are not to be confused with the 1960s Cornish band The Onyx, of course! Although The Onyx were known for their impact in the genre of psychedelic rock, I'm pretty sure Diamine Onyx Black is reflecting the beautiful layered black and white Chalcedony - a form of quartz. And sure enough, this ink does just that! It has a beautiful black colour yet has a little translucency to it, encouraging just a touch of the paper to show through. Jet black inks may not provide too much in the way of shading, but Diamine Onyx promises to give an interesting light-dark shading to your words. Both Onyx and The Onyx also had light-dark shaded words, but I'm pretty sure you'll prefer Diamine's. 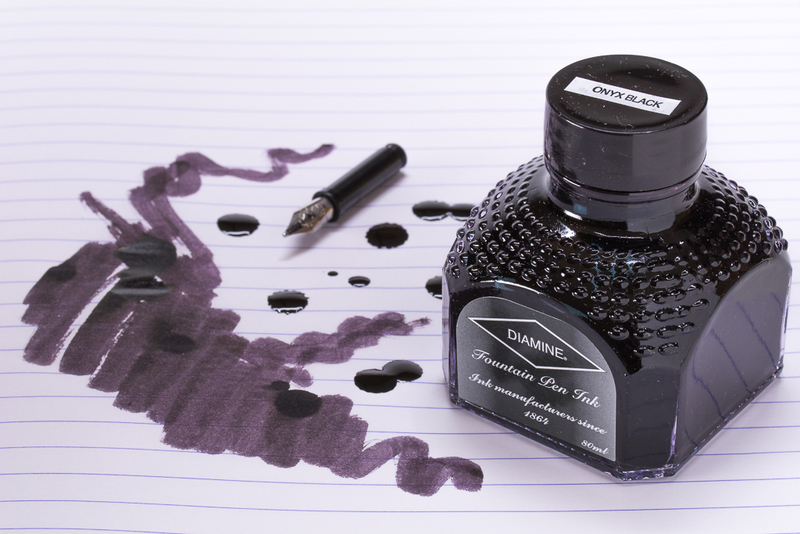 Find Diamine Onyx Black at Knight's Writing Company.